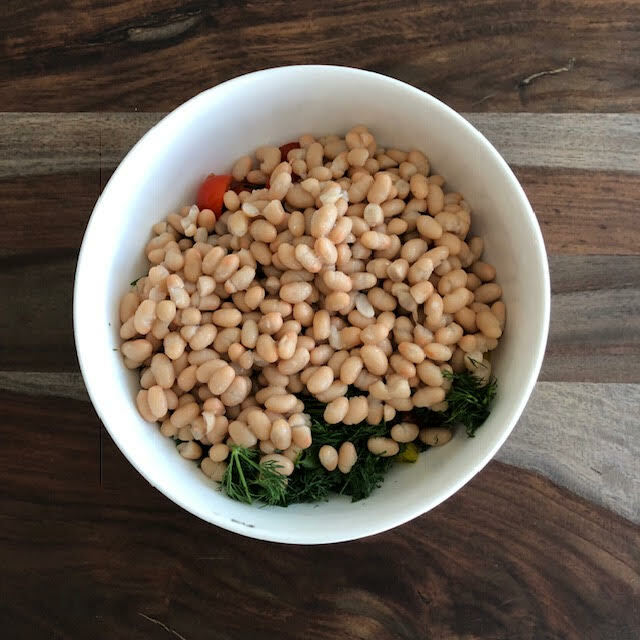 This highly requested, easy recipe is a staple in my weekly food prep because it is delicious, contains all of the macronutrients, and best of all—is simple to make! There are so many incredible variations that can be used to personalize this recipe to your liking, but here is the basic recipe. I usually add red onion and olives but for the sake of simplicity I thought I would post the recipe ‘base’ and let you decide what you like to add to make it your own…get creative! Step 1: Cut up your veggies of choice. 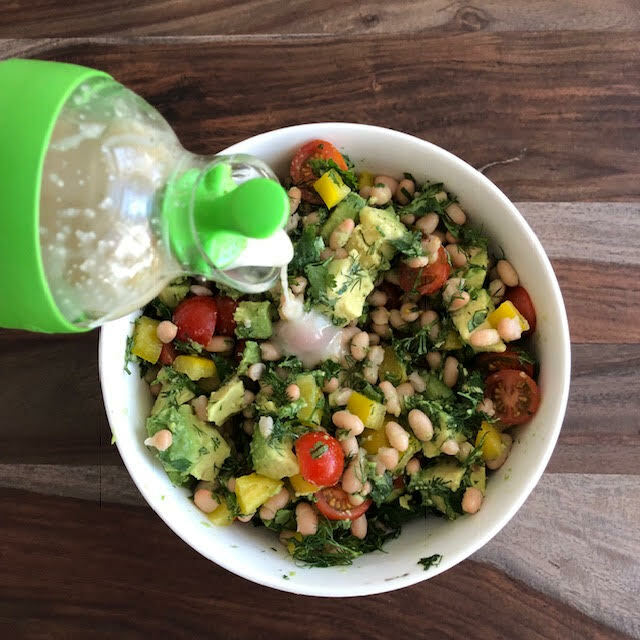 I used baby tomatoes and bell peppers which are both high in vitamin C which is needed for a healthy immune system and helps your skin glow. Add your favorite herbs: I used fresh cilantro and dill. Cilantro is high in antioxidants, protects against heart disease, UTI’s and even rids the body of heavy metals. I also love adding finely chopped mint leaves. Add chopped avocado for a creamy texture and to add healthy fats. According to many natural health doctors and nutritionists, Avocados are claimed to be one of the top 5 healthiest foods on the planet! Avocados are high in fibre, healthy mono-unsaturated fats and even contain some protein! If you aren’t already eating avocado or guacamole, I would highly advise you to add it to your daily or weekly meals. To prevent your avocado from getting too brown, I squeeze half an organic lemon on the bean salad. Not only will this prevent browning, but it is also very alkalinizing to the body. Lemons are anti-cancer, high in Vitamin C and boost your immune system. Try squeezing lemon on fish, salads and in your water to help with digestion and to improve taste. 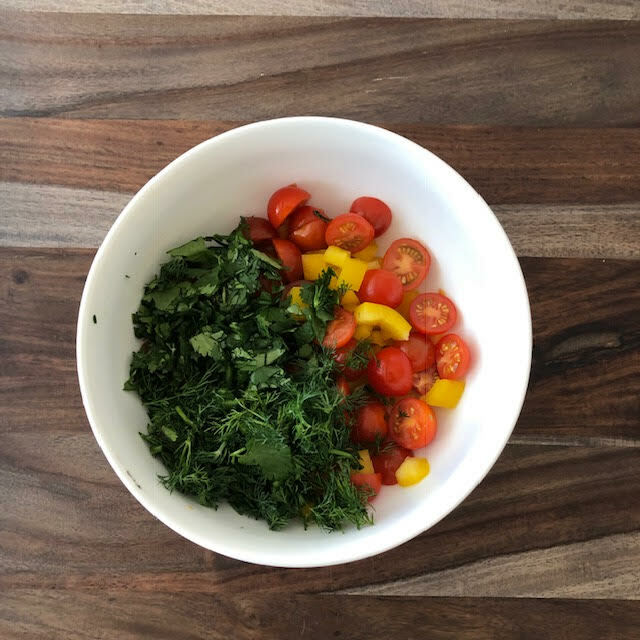 Once all of your ingredients and lemon juice are in your medium-sized bowl, mix it thoroughly and add your favourite dressing to add some flavour (optional). I always add my home-made dressing that includes seasoned rice vinegar, garlic, spices, MCT oil/avocado oil and tahini to add creaminess.